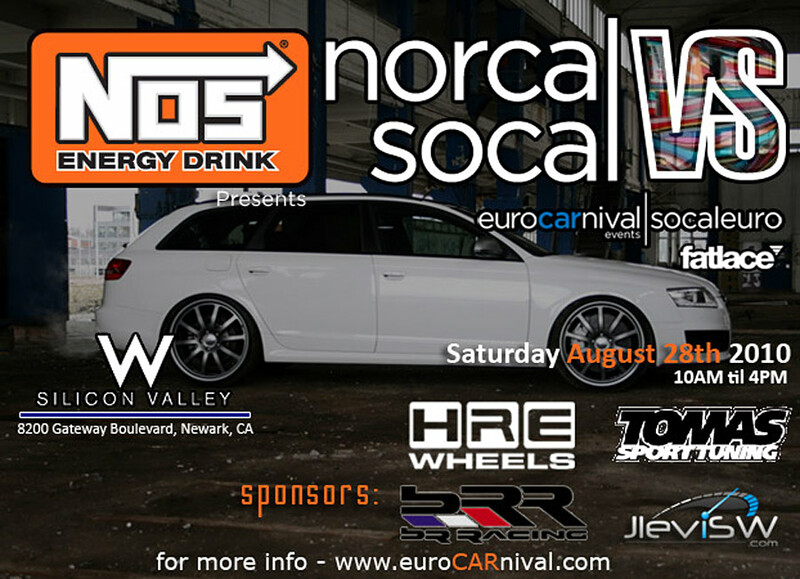 Attention all automotive enthusiasts, car show competitors, and car lovers Nos Energy Drink presents NorCal VS SoCal hosted by Euro Carnival and Fatlace this Saturday, August 28 at the W Silicon Valley from 10 AM – 4 PM. You’re invited to check out and join in on the activities. The Targa Trophy rally cars will be on display for a few hours during their day long excursion in the afternoon before they head out on the road again. The event is FREE to attend as well as to display, but space is limited so be sure to REGISTER. Some of the best JDM, Hella Flush, Euro, Exotics, Sportscars, and more will be on display at the beautiful W Hotel in Silicon Valley – 8200 Gateway Boulevard, Newark, CA‎. NorCal vs SoCal last happened in 2004. We had an amazing turn out. Let us begin again the wonderful conflict between Southern California and Northern California with a meet to join car enthusiasts all over the west coast. We would like to invite all respectable auto enthusiasts, Euro’s and non euro’s. Fatlace, Hellaflush, VIP, JDM. As long as you appreciate all forms of automotive excellence, you are welcome. We’ll be hosting the event up in the Bay area outside of Fremont. We will be hosting the car expo for Targa Trophy. They are expected to arrive around lunch time and the rally drivers will get to mingle with everyone. W hotel will be hosting a BBQ at the event. You can purchase drinks as well from the BBQ. Feel free to setup an EZ-up and chairs to hang out. Going to be a great weekend! !